Chris Gayle struck a 47-ball hundred, his second T20I century, as England’s bowling attack was shredded down in Mumbai, with West Indies comfortably chasing down a tall order of 183 runs. This was after the English batsmen showed enough promise to score an exciting 182 for six in their allotted 20 overs. The stage was well set for the talking to end, and for England to show everyone that they do indeed mean business in the most attacking format of the game. Everything this young English side has done in the last 12 months or so, since the embarrassing depths of the 2015 ODI World Cup, has built up to this tournament. And they didn’t disappoint, in a way. Jason Roy (15) and Alex Hales (28) bade their time at the start, before cutting loose. In particular, the latter was very keen in this regard, timing his shots to perfection. Hales knew at what moment he wanted to steal a boundary and thus despite the loss of Roy’s wicket, the score still read 49 for one at the end of the power play overs. This is where Joe Root (48) took the initiative for England. He was off the blocks in no time, and had quickly overtaken Hales in the scoring charts. He worked the ball well into gaps, looked busy, ran his runs very hard and then started stealing boundaries at will. Their 55-run partnership was the reason why England were comfortably placed at 81 for one at the halfway mark in their innings. At that stage, England would have hoped to reach at least 170 at the completion of 20 overs, and they didn’t do much wrong, getting to 182. They scored 42 for two in overs 11-15 and then got another 59 for three in the last five overs, thanks to Eoin Morgan (27 not out) and Jos Buttler (30 not out) exhibiting their hitting skills. But was it going to be enough against Gayle? In a one-word answer to that last question, no! But it wasn’t apparent from the first ball, as Johnson Charles (0) made a hash of things and for a bit, Marlon Samuels looked completely out of sync with the crease. But with Gayle knocking over Reece Topley’s very first over for 10 runs, it eased the pressure on Samuels at the other end. Slowly, he opened up and for a brief period of time, he even outscored Gayle, racing to 37 runs off 27 balls. In turn, it allowed the big-hitting opener to get his eye in further, and the effects were devastating to say the least. After Samuels got out, it was the Gayle show all along the way, a combination of timing and brute power-hitting as England didn’t know what hit them. Gayle took 16 runs off the ninth over by Adil Rashid (1-20), another 18 off the 11th by Ben Stokes (0-42), and then 22 runs off the 14th bowled by Moeen Ali (1-38), inclusive of three successive sixes. In all he hit 11 sixes as the Wankhede boundary, nay stands, were peppered by his shots. He also hit five fours but no one noticed those, except maybe the bowlers who were thankful for small mercies. 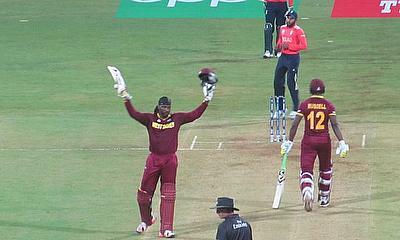 With the target approaching then, Gayle brought up his second T20I hundred in the 18th over. At the innings break, it was a wonder if England had enough runs to buffer up for a Gayle onslaught. Such was the ferocity of his innings that victory came with 11 balls to spare, and so any buffer would have been rendered useless. For England this will be a massive blow to their morale. They didn’t do much wrong when batting, putting up a challenging total for any 11 sans Gayle. Indeed, the English bowlers were inconsistent with their line and length on most occasions, but that can be spared on account that they came across an indomitable force whose bread and butter is such knocks on sub-continental wickets. As such the question to ask is, if they can recuperate from this shellacking in time to take on South Africa on Friday, or will this defeat sap their newfound aggression? In terms of the Group 1 placements, England now find themselves with a -0.973 run-rate. It isn’t as bad as what India suffered on Tuesday. Yet, despite an easy game against Afghanistan to come, they should be worried about their prospects already. Meanwhile, for the West Indies, it is time to party - at least until the next match comes about.